The London Wetland Centre, located in Barn Elms, southwest London, is a wetland conservation partnership between the Wildfowl and Wetlands Trust (WWT), Thames Water and the Berkeley Group. The land was originally owned by Thames Water. The Berkeley Group purchased part of the site for development; some of the income generated was donated to the WWT for the construction of the centre. An agreement among the three parties was signed to ensure financial support for the project. The Berkeley Group donated £11 million from the sale of houses to establish the centre. Then WWT further raised £5 million from the general public. This model of development is an excellent example of collaboration between business and conservationists. The WWT has engaged teams of scientists to ensure that the centre remains attractive to wildlife. A professional fundraiser has been hired to secure sufficient funding for sustainability planning. The operation, maintenance and development of the London Wetland Centre is the sole responsibility of the WWT. The centre is a showcase for the transformation of wasteland to ecologically valuable wetland. 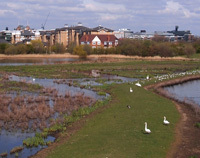 Located close to the city centre, this urban wetland is now a well-known attraction in London that is frequently used for education and research purposes. The development manager for Nam Sang Wai is KHI Holdings Group (KHI), which is wholly owned by the Fu family. KHI is one of the founding members of the World Wide Fund for Nature Hong Kong’s Corporate Membership Program, and has been a diamond member since 2000. For the full proposal, please visit this Hong Kong Government website. We welcome public feedback and involvement in our project. © Nam Sang Wai Development Company Ltd. All Rights Reserved.